Does Pasteurized Juice Have Nutrients? When you drink a glass of juice, you want it to be nutritious and free from disease-causing germs, such as E. coli and Salmonella. Pasteurization is the process of treating juice, milk and other foods to kill harmful germs, usually by heating. Although the levels of certain nutrients in juice may decrease with pasteurization, the final product retains most of the original nutritional value. Because raw fruit juice may contain disease-causing germs, the U.S. Food and Drug Administration requires a warning label on all unpasteurized juices sold to the public. The sugars and minerals in juices are typically unchanged by pasteurization and remain present in high concentrations. Pasteurized apple, orange, grape, pomegranate, tomato and carrot juices contain substantial amounts of the minerals potassium, phosphorus and magnesium. Carrot and tomato juice also provide you with moderate amounts of iron, zinc and selenium. The sugars in juices account for the overwhelming majority of the calories. 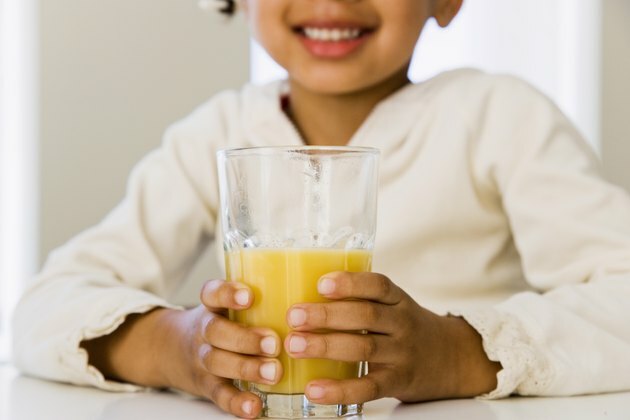 An 8-ounce glass of pasteurized apple juice contains approximately 24 grams of sugar and 114 calories; a comparable serving of orange juice contains 21 grams of sugar and 122 calories. Pasteurized grape and pomegranate juice contain higher concentrations of sugars, with roughly 36 grams and 32 grams per 8-ounce serving. Vitamins are more vulnerable to heat destruction than are sugars and minerals. Pasteurization may cause low-level loss of some of these micronutrients. Vitamin C, also known as ascorbic acid, is the most vulnerable of the vitamins to heat degradation during pasteurization. Fresh-squeezed orange juice contains approximately 124 milligrams of vitamin C per cup; pasteurized orange juice contains approximately 84 milligrams, nearly one-third less. However, the amount of vitamin C in a single cup of pasteurized orange juice exceeds the recommended daily allowance for adults. Pasteurized grape and tomato juices are also good sources of vitamin C, with 63 milligrams and 45 milligrams per cup, respectively. Thiamine may partially degrade during juice pasteurization. Although many pasteurized juices contain low levels of thiamine, fortified cereals and rice, whole-grain products, nuts and meats are the principal sources of this B-complex vitamin in the American diet. Other vitamins commonly found in popular fruit juices include B-6, E, niacin and riboflavin. The levels of these vitamins vary depending on the type of fruit juice and processing techniques. Different pasteurization techniques are used for various types of juices. Temperature and heating time are the two main variables in the process. Heating for a brief period kills most, but not all, bacteria and fungi; these juice products require refrigeration to prevent spoilage. Juices that do not require refrigeration have been heated for a longer period to kill all bacteria and fungi. After you open pasteurized juice, it may lose nutritional value due to exposure to light and the air. To optimize nutritional value, store pasteurized juice in the container in which it came and use it within seven to 10 days after opening.